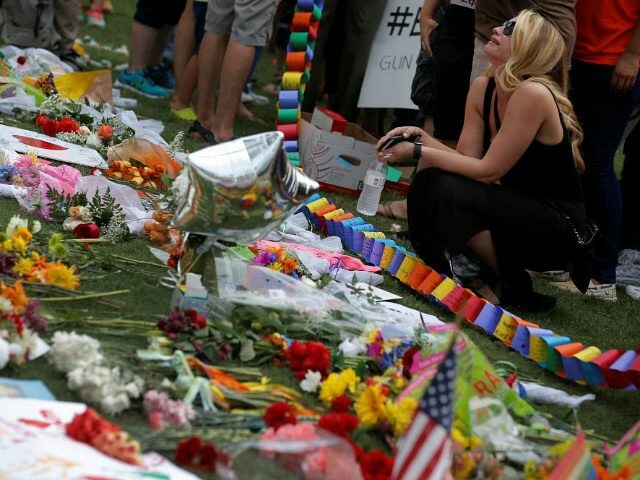 Florida’s Orange County Medical Examiner’s Office has released the results of all the autopsies of victims of the jihadist massacre at Pulse nightclub two months ago, finding that the 49 killed took over 200 bullets collectively, with one victim being shot ten times. Twenty of those killed were shot in the head, local news reports, and even those for whom one bullet was the deciding factor in killing them were hit with “dozens” of bullets, fragments, and debris indicating shooter Omar Mateen was looking not just to systematically execute his victims, but mutilate their bodies. According to the local CBS affiliate, there is no official total of the number of bullets that hit victims and survivors, but their tally puts the total number, including survivors, at more than 260. The individual autopsies tell harrowing stories of those who were shot first. Many were shot in the front, indicating they had no time to flee. One man, the Orlando Sentinel notes, was shot ten times. Another received three gunshot wounds to the head, though only one would have been enough to kill. “Bullets hit them in nearly every possible place, including the head, chest, legs and back,” the Sentinel reported last week, before all the autopsy results were made public on Monday. As for the shooter Mateen himself, he died of eight bullet wounds, most to his front. The autopsy found that one of the alternate theories explaining his behavior – that he had been on steroids and hormonally inclined to violence – was not possible, as his hormone levels were too low for a person artificially inflating their levels through steroids. Mateen stormed the club on June 12 and began shooting into the crowd indiscriminately during the Pulse gay nightclub’s “Latin Night.” During the siege, he called 911 and pledge allegiance to Islamic State caliph Abu Bakr al-Baghdadi in Arabic, in a conversation the FBI initially censored but later published in its complete form after national outrage. Coworkers recalled Mateen as making consistent complaints that his peers did not respect his religion and making violent threats towards large groups, particularly black people. His complaints did not get him fired from his job at the security firm G4S, but did get him transferred away from objecting coworkers. Despite his clear oath to the Islamic State, many alternate theories about the reason begin his attack circulated shortly following the shooting, including a theory that Mateen himself was gay. The rumors that Mateen was gay were exacerbated by men who claimed to have seen Mateen at Pulse previously or conversed with him on gay dating mobile applications. The FBI has repeatedly asserted it has found no evidence that Mateen was gay or used gay dating apps, and later revealed that they had found evidence that Mateen may have been carrying on an affair with a woman.